Yet contagion has spread from energy, metals, and mining to other industries and up the scale. 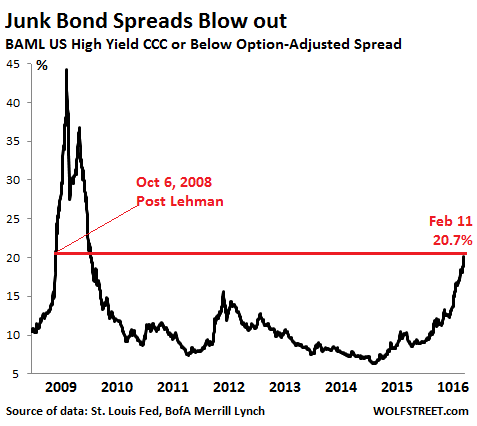 According to UBS, about $1 trillion of these junk bonds are now “stressed” or “distressed.” And the entire corporate bond market, which is far larger than the stock market, is getting antsy. It didn’t help that Standard & Poor’s just went on a “down-grade binge,” as S&P Capital IQ LCD called it, hammering 25 energy companies deeper into junk, 11 of them into the “substantial-risk” category of CCC+ or below. Back in the summer of 2014, during the peak of the wild credit bubble beautifully conjured up by the Fed, companies in this category had no problems issuing new debt in order to service existing debt, fill cash-flow holes, blow it on special dividends to their private-equity owners, and what not. 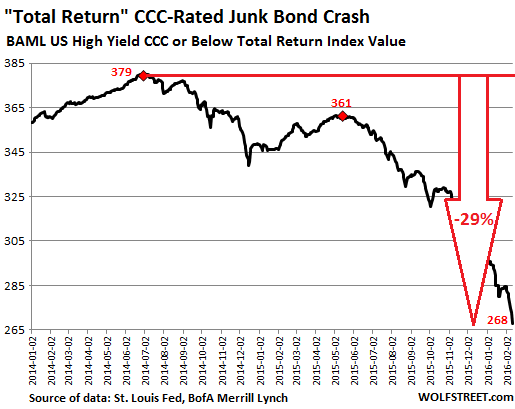 The average yield of CCC or lower rated bonds at the time was around 8%. But now that they’ve opened their eyes, they’re running away. And so the market for new issuance is grinding down. “Another tough week,” S&P Capital IQ LCD said on Thursday in its HY Weekly. There was one small deal earlier this week: Manitowoc Cranes’ $260 million B+ rated second-lien notes that mature in 2021 sold at a yield of 14%! The market was hit hard again this week amid solid volume trading as oil prices plunged anew. There was a meager attempt at stability on Wednesday, but some participants described it as similar to the calm at the eye of a hurricane. That proved true today, as markets fell further. There was red across the board with losses in dollar terms ranging 1–5 points, depending on the credit and sector. The huge U.S. Treasury market rally gave no technical support, even as the yield on the 10-year note, for one, pierced 1.6%, a 4.5-year low. And retail investors are catching on. Over the past three sessions alone, they pulled $488 million out of the largest high-yield ETF, the iShares HYG, which on Thursday closed at 75.59, down 21% from its high in June 2014, and the lowest level since May 2009. On a broader scale, investors yanked $5.6 billion out of that asset class in January, the fourth month in a row of outflows. All grades of junk bonds have been losing ground: the S&P High-Yield Index is down 3.9% year-to-date. But it’s in the CCC-and-lower category where real bloodletting is occurring. S&P now expects the overall default rate to reach 3.9% by the end of 2016. But it may be the rosy scenario; last March, S&P still thought the default rate at the end of 2016 would be 2.8%. Credits are deteriorating fast. Among these CCC-rated retailers and restaurants are Claire’s Stores, Logan’s Roadhouse, and the Bon-Ton Department Stores. Others, at B-, are just a downgrade away, such as Toys “R” Us, 99 Cents Only Stores, or P.F. Chang’s China Bistro. Some are rated B, such as Men’s Wearhouse and Neiman Marcus. If these companies need money, it’s going to get very expensive. Severe broad market volatility shuttered the investment-grade primary market for a fifth consecutive session Thursday, as secondary-market spreads continued to widen. I was just driving out on a popular street in the burbs and could not believe how many chain retailers had sprung up in the last year. No way can more than half of them survived. If you see retail shops that always seem to survive despite next to no visible patronage, chances are they are really a money laundering front especially in an area where rents are high. Almost all the chains make their real money by raising it on Wall St., not running the business. The reason you see constant expansion is, that is the price they have to pay, to show they are using the investor money responsibly. In the last few years you are getting contraction because the Wall St. money is drying up. If the stores had to pay for themselves most chains would be at least half the size. That’s certainly been my frequent impression in certain Vancouver neighbourhoods. Yeah……well……what goes up must come down. Although the top guys in the finance world seem to have forgotten that for a couple of decades. One of the businesses you mentioned issues credit cards charging 29% interest. It is really, really, really hard to feel bad for them. Now they know how their customers feel when they get the bill. Not to mention it is another reason why customers won’t go into debt to shop, they can’t afford it. Money is just too expensive. It must first be conjured into being by issuing debt. Which then must be leveraged. They are then sold into financial entities. To pay for these credit “instruments” buyers issue bonds. The bond buyers are seeking yield because of ZIRP. Only they must settle for pennies on the dollar. Because there is no money. It has become too expensive! Why would anyone pay 29% on a credit card? If that’s the rate someone is offering – then get a different card – or better still – live within one’s means and pay cash. Only a total fool would be paying 29% on money. There are really a LOT of fools out there. I worked with a guy a few years back who bought a 5 year old pontiac firebird (20k) with a credit card. These are also the kind of people that when the bills keep piling up, they just don’t pay them. Right. But it’s not the credit card company that is at fault…. Fools are generally bad credit risks …. so 29% is what they get to pay for the privilege of bankrupting themselves. My point was, they are getting their just deserts. They are complaining about having to pay high rates to borrow, when they have always extorted their customers. Whistleblower 2002. Retaliation at home and work. Blacklisted. Undiagnosed autoimmune disease for three years. Enormous medical out of pocket. Then, an agonizingly slow recovery until cognitive deficits resolved. All manor of strange and costly problems in my life to the present. To sum; unable to work, partially disabled though not apparently so, spent through substantial savings and investments. Lost some in crash. Sold car. Now, only my house is left. Must use credit for delivered groceries, property taxes, insurance, repairs to house which I perform myself, most things I buy. Cannot afford cab to shop. Family doesn’t understand what has happened to my life. Why I can’t work. Excellent credit, responsible, educated, socially conscious. Small social security income. Cannot qualify to refinance or apply for lower interest cards. No safety net for whistleblowers. I know how to swim but waves are terrifyingly large. All lifelines have been withdrawn. Why would anyone pay interest on any credit card? Only an idiot would not pay the card off before interest was applied. There was a time in my life when I paid interest on credit card balances because I bought something big (like a couch) and didn’t have the money to pay it off right away. It’s called an installment loan. You pay interest on your car loan. You pay interest on your mortgage. And sometimes people just don’t have the money. Sure it would be better not to go to the grocery store but wait until you get the money. But you know, sometimes you gotta put food on the table, even if you pay interest on it. Tough spot. The help must come from friends, community and family. Renting out rooms in my house gets me through tough spots. Re Autoimmune diseases, there is lots of detoxification remedies online, like borax, bentonite and the Gershon method. The medical cartel is useless much of the time. Become your own doctor with research. Thank you for your considerate response. Am doing the best I can with diet. Highly educated in that regard. Renting rooms is not an option. Very high stakes whistle blowing issues. Ubiquitous retaliation to match. Heavy smear campaign to discredit me has also had deep consequences. Ditto here. Whistleblower in 2006. Blacklisted in the industry and marriage ruined and family broken by the near-poverty. Great post, Wolf. In a different sector, I have the same blindingly obvious terror about why anyone in their right mind would want to buy Abe debt – and pay for the privilege. The world has gone mad, and the markets have at last realised this. I think that we have a while to go yet. Mr. Market still believes in his heart of hearts that the Fed will ride to his rescue dressed in silver armor and mounted on a white horse like Sir Lancelot. The time to worry about is when he realizes that the Fed CAN’T rescue him. That is when the doo-doo is going to go down for real. I don’t know exactly what will trigger it, but there is no lack of suspects. Money-printing (QE) hasn’t worked and zero interest rates (ZIRP) haven’t worked. The only flim-flam the Fed has left to pull out of its magic hat is negative interest rates (NIRP). In Europe and Japan, stock markets have been plummeting because there is only one inescapable conclusion to be drawn from NIRP: Negative interest rates imposed by central banks are an explicit vote of no confidence in a country’s economy. As such, my guess is that things get ugly sooner rather than later. How long the market stays afloat in the US probably depends on how much stock the big investment banks have left to palm off onto the suckers, who would be retail investors and pension funds. Agreed, but the central point is that Central Banks, seen through a stand-up comedian metaphor, are rapidly approaching the point at which they are booed off of the stage. The audience loved the first few jokes, but have become increasingly restless of late. There may be a small burst or laughter left here or there, but people are already beginning to leave, and many others are asking for the check. The Fed has a lot of crap on their books from the QE programs. Maybe they see NIRP as a way to implicitly write down the debt. A way to retire it thru accounting tricks. I don’t know if this is the case but I know nobody is going to buy this crap. I do know they are up to something. Those ‘retail investors’ are not-so-bright pension funds who at times are forced to chase yield and stay in the market. If you look for cause and find unfairness, it will probably do. Every incumbent in every office across the whole world needs to be kicked out of power. We need to change *all* our leaders, every single one. Wolfgang Schaeuble is older than Moses, his face looks like a melted soft taco shell. We shouldn’t allow people to rule if they made a cameo in the Old Testament (he was the one who got trapped in the whale). Right now it looks like the European Union is the worst idea in the History of the Universe. EU is like a sexless marriage to a cluster B female monster: they wanted in, now they want out but they’re afraid of losing the house and kids. Eventually we’ll see them all downsized to a studio apartment across town, swiping Tinder listlessly and listening to Christian Rock music. Spain, I’m looking at you. Spain created a Bad Bank and collected all Bad Loans from Spanish banks to its balance sheet. The devil is wiser for being old then for being a devil. He just needs more vitamin C in his diet. Bet he also has varicose veins. Vitamin C will cure those, too. As to new leaders: “Better the devil you know than the devil you don’t”. I’m with youin that sentiment. Have you ever read (or listened to as in my case) the book ‘ bad Samaritans’? Couple what’s disclosed there with how the world got out of its last funk (WW2) and you start to understand what General trend the future will bring ( minus the global war, we have a bombs now). Check your chart: HYG’s May 2009 low was $48.16. It’s nowhere near that level now. What chart are you looking at? By mid May, 2009, HYG was at 77 and rising. “The lowest level since May 2009” means exactly that. and it appears to bear me out. What’s going on here? One of us is quite wrong. At first I thought it might be a C$/US$ conversion issue. But that doesn’t check out. So, like you, I’m stumped. Question is: who’s chart is right? Yours or mine. In my world, HYG has a ways to go yet before bottom. In your world, it’s lights out. My Bloomberg confirms Wolf’s numbers. HYG hit 77.05 on May 22, 2009. The low for that month was a 73 handle. The low for 2009 was 61.64 on March 9, 2009. Bloomberg is almost never wrong, albeit expensive. The dance floor is filling up. Still a little room for more. Until a dancer falls down. Causing a “domino moment” of player’s. The music stops. Think – the global economy. But. more importantly, whats occurring in Syria. The powers that should not be, know war is good. Now it seems, its the only option left to them.